With 40 Years of Professional Experience. The Musical Instrument Repair Shop is a full service wind instrument repair facility. Trumpet, flute, clarinet, saxophone, trombone and cornet repairs are performed by our master craftsman with over 35 years experience in all areas of woodwind and brasswind repair and restoration technology. Our level of expertise is guaranteed to satisfy and delight the most discerning professional musician. From minor repairs and adjustments to complete restorations and custom modifications, the Musical Instrument Repair Shop offers a degree of excellence that is rare in the music industry. We specialize in quality repair service of clarinets, trumpets, saxophones, flutes, Accordions, trombones, French horns and many more. We also offer our custom creations service, which is a unique and highly specialized service. The concepts and designs created at the Musical Instrument Repair Shop have been adopted by major musical instrument manufacturers and enjoyed by serious professional musicians around the world. 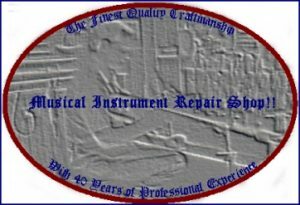 The Musical Instrument Repair Shop’s fine selection of cases for all instruments, mouthpieces, mutes, valve oils, key oil, slide oil, slide cream, slide grease and many other premium quality accessories is the result of over 40 years in providing musical instrument service to professional performing musicians. Many of these products have been used at the bench in our professional musical instrument restoration shop. Please click on any of the buttons below to visit our Musical instrument Repair Shop Online Store.